Huddling around the fireplace under blankets because the heating system quit during a cold winter night makes for great stories to tell—later. In reality, the situation is uncomfortable, stressful and could even be dangerous. The same holds true if the air conditioning system does not work during a heat wave. We want to help you avoid those situations, starting by explaining the most popular heating and cooling systems found in homes. We will give you tips on how to keep them running more efficiently, as well as signals that it’s time to replace an aging system. Finally, we’ll include a guide to hiring the right heating, ventilation and air conditioning (HVAC) contractor to replace the system. Heating- There are three components to a typical heating system: a heat source, distribution system, and the controls (the thermostat on the wall). 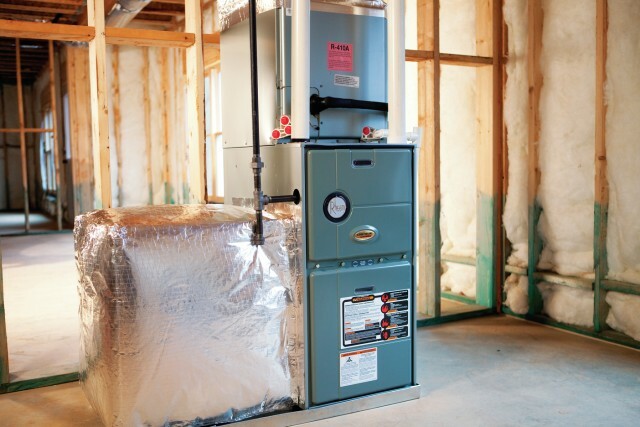 Most homes rely on a furnace, a boiler or a heat pump as the heat source. Furnaces heat air and then circulate the warm air through a system of ducts. The heat is delivered to the living area through registers that are attached to the ducts. This type of system is called a forced-air system. Boilers heat water and then circulate either the warm water or steam through pipes. Radiators and baseboard heaters supply the heat to the rooms. Air Conditioning- All air conditioners, as well as all types of refrigeration, work the same way—they take heat from one area and move it to another area. In a central air conditioning system, a fan draws air through ducts to an evaporator coil that removes heat and moisture from the air. The cool air is then blown back into the room. The original heat is transferred to a refrigerant that flows to an outdoor unit that contains a compressor and a condenser, which releases the heat into the outside air. Window air conditioners work the same way, except that everything is contained in one cabinet. The Controls: Both heating and cooling systems are controlled by a thermostat that is located somewhere in the living area. A basic thermostat has one temperature setting, but programmable models let you set a variety of temperature settings based on the time of day. This allows you to reduce the need for heating or cooling when you’re not home, so you don’t waste your money or energy resources heating and cooling empty space. 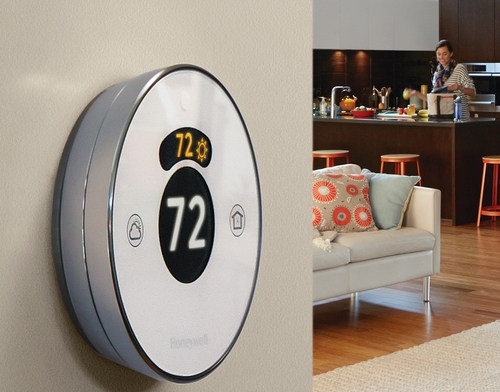 Some models, like the Nest, learn your daily schedule and automatically update the temperature accordingly. Programmable thermostats help you manage your energy usage and could save you money, including through energy rebates offered by utilities. Check with your local provider to see if they offer discounts and rebates to customers using energy-saving HVAC components like programmable thermostats. Air conditioning compressors release hot air outside your home, while a boiler system circulates heat inside throughout a system of pipes. A heat pump is an electrical device that provides both heating and cooling, producing about one and one-half to three times the energy it consumes. In the cooling mode, heat pumps operate like any air conditioner, pulling warm air out of the house and replacing it with cool air. In the heating mode, they extract heat from the outside air—even below-zero temperatures contain some heat—and transfer it indoors. The type of heat pump described here is called an air-source heat pump. There are others, including geothermal heat pumps, that use the earth as a heat source. However, let’s concentrate on air-source heat pumps as they are the most common. Until recently, heat pumps were confined to warm-weather states that do not experience prolonged bouts of cold weather, because heat pumps become less efficient as the outdoor temperature drops. However, recent advances in technology that include two-speed compressors and new coil designs make some models suitable for cold-weather climates. Because heat pumps provide both heating and air conditioning, they are rated in two ways. The seasonal energy efficiency ratio (SEER) measures the efficiency of the cooling system. The higher the number, the more efficient the system. Federal regulations call for SEERs of 13 or 14, depending on where you live, but heat pumps with a much higher rating are available. The seasonal heating performance factor (HSPF) measures the heating efficiency of heat pumps. The minimum is 7.7. Discuss your options with a qualified contractor, but, in general, if cooling is your major concern, look for a unit with a higher SEER. In cold weather areas, look for a high HSPF. Heat pumps are available in ducted and ductless models. 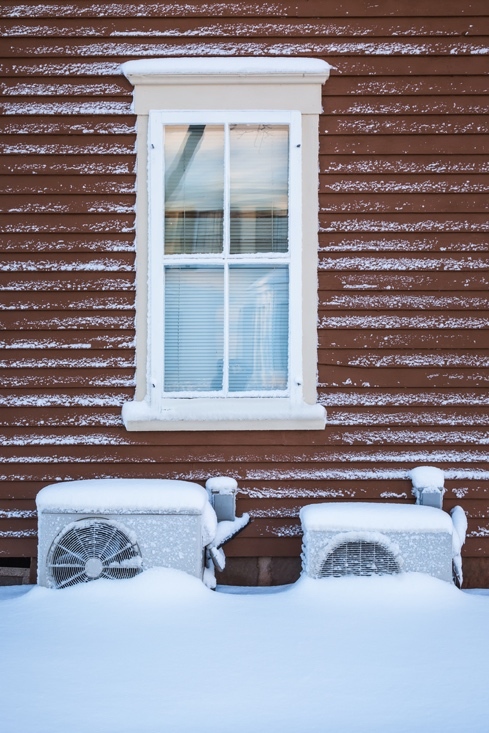 A heat pump sits outside of a home in winter. A ductless mini-split system provides cooling—some models can provide heating as well—without the need to install ductwork. Like central air conditioners, they have both an indoor and outdoor component. The cabinet outside that holds the compressor and condenser is connected to the interior unit by a 3-inch diameter pipe that carries the electrical connections and refrigerant lines. Ductless units are designed to provide heating and cooling to areas that are not serviced by the home’s existing HVAC system, such as an attic or any other room that has been converted to living space. They can also provide cooling without the need to install ducts. Basic ductless units can heat and cool one room, but some models can accommodate up to eight different rooms. Each indoor unit has its own thermostat, providing zoned comfort. 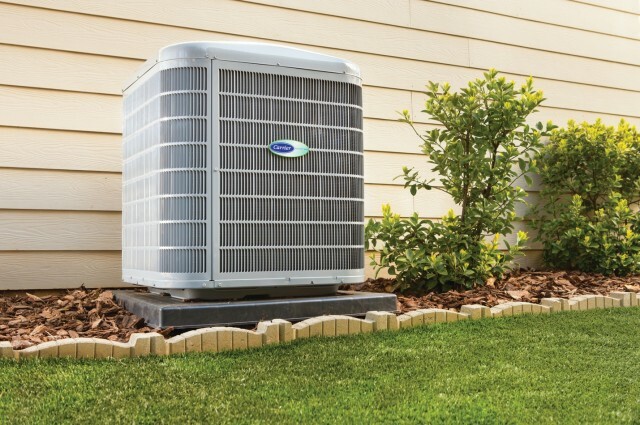 Newer models use the latest energy-saving heat pump technology to help keep energy costs down. Because many indoor units are installed at the top of a wall, most models are operated by remotes, some of which are Wi-Fi enabled. In addition to keeping everyone comfortable, the heating and cooling system accounts for almost one-half of a typical household’s energy bill, so having it function properly makes economic sense. A major repair or replacement of an HVAC system is a big-ticket item. If you are looking to buy a home, consider having a heating and cooling contractor inspect the system of the house you are interested in. He or she may be able to spot potential problems that could lead to major headaches once you move in. Likewise, if you are selling your home and you’ve kept up the maintenance on your system, brag about it. Show potential buyers your maintenance records. Provide information about the age of the system, especially if it is relatively new. Energy-efficiency ratings go a long way to assure buyers that the system will last. Boilers, furnaces and air conditioners are rated by how energy efficient they are. Furnaces and boilers have an annual fuel utilization efficiency (AFUE) rating. It measures how efficient the device is in converting fuel into heat. An AFUE of 90 percent means that all but 10 percent of the fuel is converted to heat. There are minimums for newly manufactured equipment, but some furnaces can achieve AFUE ratings of over 95 percent. Boilers have slightly lower AFUE ratings. All-electric furnaces can be 95 to 100 percent efficient, but the high cost of electricity—most electricity is generated by burning oil, coal or natural gas—makes this an uneconomical choice. Space heating using electricity is mainly confined to the Southeast, which has lower heating demands than the Northeast and Midwest. Houses that heat with electricity are good candidates for heat pumps. Cooling equipment is measured by the seasonal energy efficiency ratio (SEER). Depending on where you live, SEERs of 13 or 14 are mandatory, but you can find equipment that is much more efficient. Energy Star is an Environmental Protection Agency program that sets minimums for the energy use of a number of household appliances, including heating and cooling equipment. It is a voluntary program, and manufacturers who meet the requirements can display the Energy Star logo on their products. There are many HVAC products that exceed the Energy Star minimums, but it is a good place to start. You can find a listing of products at energystar.gov. You will find that a smooth running and efficient HVAC system is important to the comfort and safety of everyone in the home. But another reason to keep the system maintained consistently is that if you don’t, it may break down when you need the system the most (which is also when HVAC contractors are the busiest). So it may be difficult to get someone to fix the problem quickly. * Checking for leaks where appropriate, including leaks in the venting system. The bottom line? 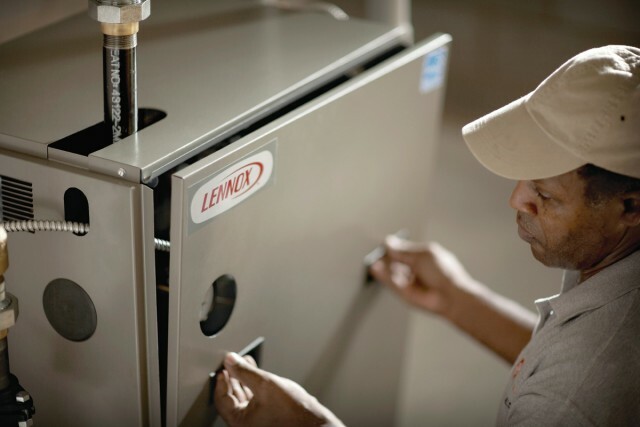 Preventative maintenance by a professional HVAC contractor keeps systems running smoothly. For ongoing maintenance for a system that includes both heating and cooling, you should change the filters on forced-air systems about every three months (although if you live in the chilly Northeast or Midwest, or in the steamy Southeast and sweltering Southwest, you may need to change filters even more frequently when at peak use). 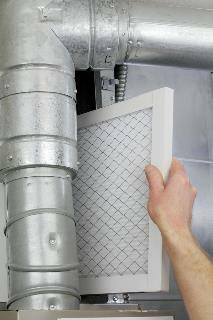 If the systems are separate, change the filters every three months during the heating or cooling season. The type of filter to use and directions for changing it can be found in the manual that came with the system. If you don’t have one, ask an HVAC contractor for advice or visit the manufacturer’s website to see if manuals are available. Check around the house to make sure that heating and cooling vents, baseboard heaters and radiators are not blocked by furniture. If they are blocked, the system has to work harder to provide you with the comfort you want, placing a strain on the system. It is also wise to vacuum the face of the vents to remove dust and other debris. 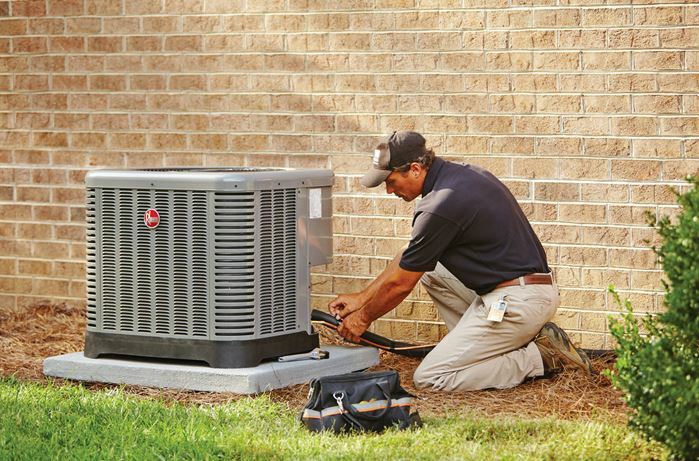 Air conditioning systems often have an outdoor component that houses the compressor and condenser. This part of the system dumps the hot air from your house to the outside as part of the cooling cycle. Keep leaves and other debris off of the top of the unit, and clear a two- to three-foot space around the unit to help it work properly. It is always best to refer major problems to an experienced contractor, but there are some problems that you may be able to fix. There is a vent on the outside of steam radiators that lets air in the radiator escape as steam fills up inside. If the vent is spitting water, it is clogged. Thus, the air cannot escape and the radiator will not warm up. The vent simply unscrews, allowing you to replace it with a new one. If a hot water radiator will not get warm, you may have to bleed it. Turn the thermostat down to stop the flow of water through the system. Locate the bleed valve on the radiator. Have a bucket and rags ready to avoid water flowing onto the floor. Open the valve using a screwdriver, and let the air bleed out. Once the air stops sputtering, you are finished. * All duct sections should be sealed. Ducts tend to leak where sections are joined together, wasting both energy and the money you pay for that energy. Use a duct sealing mastic or aluminum tape to seal the openings. Don’t use what most people think of as duct tape because it will not last. Use only tape made for heating and cooling ducts; it will have Underwriters Laboratories (UL) on the label. * Any ducts that run through unconditioned space, such as an unheated attic, basement or crawl space, should be insulated to prevent energy loss. Insulating ducts can save a significant amount in energy costs. * If the problem persists, have a contractor check out the system. There could be a restriction of some kind in a duct or the system itself may be poorly designed, which can hinder the flow of air through the ducts. As houses have become more energy efficient, concern about the quality of the air inside the home has grown. Tight, weather-sealed houses can trap indoor pollutants, causing discomfort or mild irritations. Believe it or not, the HVAC system can play a significant role in indoor air quality. Humidifiers can be installed in forced-air systems to keep occupants comfortable and prevent wood floors, moulding and furniture from drying out and warping. Air purifiers can be installed in ducts. These purifiers can eliminate odors and kill bacteria and germs that are either airborne or on surfaces. There are a number of different systems. Some rely on filters to remove harmful pollutants from the air. Others work by changing the composition of the pollutants through an oxidation process. Once the pollutants are destroyed, the oxidizers revert to harmless oxygen or hydrogen. These systems are increasingly commonplace and can be installed by a qualified heating and cooling contractor. 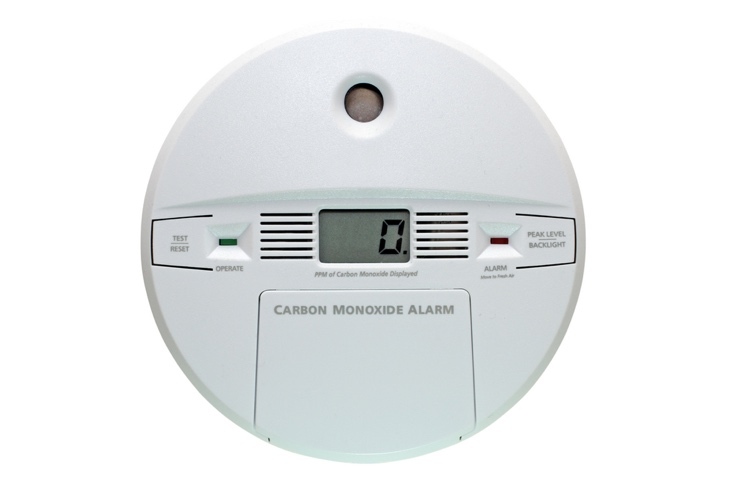 Carbon monoxide (CO) is an odorless, colorless and tasteless gas that is produced by the incomplete combustion of fossil fuels, such as fuel oil, natural gas and propane. At low doses, it can cause dizziness and headaches; at high doses, it can cause loss of consciousness and even death. The best defense against CO is to keep heating and cooling equipment well maintained and running efficiently. If you don’t already have them, install CO detectors. The Consumer Products Safety Commission recommends installing one outside the bedrooms in each sleeping area of the house. Follow the manufacturer’s instructions for installation and testing the detector. If the detector alarm should sound, move everyone in the house outside to fresh air and call the local fire department or 911. If your HVAC system does break down, you will be faced with the decision of whether to repair or replace it. Repairs can be less expensive, but there are a number of reasons to consider replacing the entire unit. The first is the cost of the repair: If the repair will cost more than 50 percent of the price of a new system, especially if the broken unit is seven years or older, investigate getting a new system. 1. An Old System. While a properly maintained system can last 15 to 20 years (depending on where you live and how hard it has to work during extreme temperature events), equipment manufactured more than 15 years ago is not as energy efficient as systems available today. With the average household spending almost half of its energy budget on heating and cooling costs, it makes sense to install an energy-efficient system, if possible. High-efficiency furnaces available today can achieve AFUE ratings of above 98 percent. That could mean drastic reductions in heating bills. The Department of Energy estimates that replacing a furnace with an AFUE of 50 percent with one that has an AFUE of 95 percent will save more than 45 percent in energy costs. 2. Frequent Repairs. Even if the repairs are minor, they are a nuisance. And don’t forget: HVAC systems tend to break down when you need them the most. If you are faced with a major repair (such as a compressor for an air conditioner or a blower motor for a furnace) and you have had to pay for a similar repair recently, it is time to replace the unit. 3. High Energy Bills. There could be a number of reasons for this, including leaky ducts or a lack of insulation and weather sealing in the house’s walls and ceilings. But it could also mean that the current system is not the right size for the house—a common problem when people add a new room or extension onto a house that increases the volume of the insulated air inside. A new, properly sized system would solve that problem. HVAC systems are part of a house’s energy package that includes not only heating and cooling equipment, but everything that affects energy usage, including insulation levels in walls, ceilings and floors, the types of windows and the habits of the people who live in the house. A professional energy audit can pinpoint areas where the house and its systems are wasting energy. That’s important information to have if you are replacing an HVAC system, because it will help you and your contractor choose the system that is best for your house. You can find an energy auditor online or by calling your local utility company. The auditor can identify energy leaks in the house as well as leaks in the ducts. Selecting a contractor to install a new system will be the most important decision you make. Get referrals from friends and family. Anyone you are considering working with should be licensed and carry liability and workers’ compensation insurance. Ask contractors for references and follow up on them. Gather at least three quotes for the job. It is important that the contractors are all bidding on installing the same equipment. All quotes should be in writing. Don’t automatically take the lowest bid. Take into consideration things like experience, references and the way the contractor presents themselves—Did he show up on time? ; Did she explain your options? ; Does he have experience installing the system you are considering? ; Does she offer a warranty on workmanship? Finally, how long has the company been in business? Have they proven they’ll be around to warranty their work several years into the future? Many contractors believe that homeowners are only interested in getting the lowest price, and recommend equipment at the low end of the price scale. But low-cost equipment may not be the most energy efficient, and it may not be the best choice for your home. Always ask about your options. At the very least, insist on an Energy Star product (but, as mentioned, some Energy Star products are more energy efficient than others). Installing a new HVAC unit is a long-term investment, but replacing old energy guzzlers with high efficiency equipment can reduce your monthly energy bills and make your house more comfortable in the process. A new heating and cooling system can improve your family’s health, reduce your impact on the planet and lower your energy bills.